An oak shield measuring 32cm made by Rogers, 51 High Street, Oxford in 1947. It is painted with the arms and motto of the Soames family with a carved wooden hanging strap painted with the name and date of the donor. Object no. 1 in this series was a single item – the only survivor from hundreds of its kind. An item which would have been so familiar to all members of the school that the importance of the whole collection of desk lids to future generations was overlooked, and all except one solitary survivor discarded in the 1920s. Object no. 2 is also totally familiar to nearly everybody in the school. Every time prospective parents are shown around or somebody invites a guest to a meal in Hall, it is a talking point. But the single object is very rarely seen on its own. It is an integral part of a Radley institution which comprises nearly 370 individual objects. Should a single shield be separated from its context it becomes a nuisance, lying around in an office or workshop awaiting repair, anonymous, and in danger of being lost. This is about context and familiarity; it is about status and identity; it is about commemoration across generations; about how long it takes for an idea to become a tradition; and about the inquiring mind of a schoolboy. This individual shield was put up by Robert Harold Soames of G Social, in 1947/8. 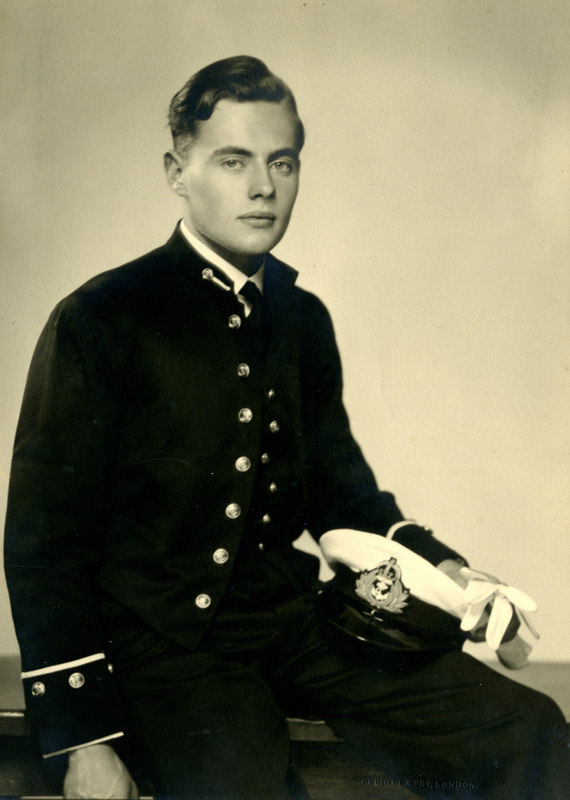 Robert Soames was born in 1929, the son of Lt-Col. AA Soames, DSO, and came to Radley aged 13 at the height of World War 2 in September 1942. He played cricket for the first XI in 1946, and represented the school at fives. He was a prefect. 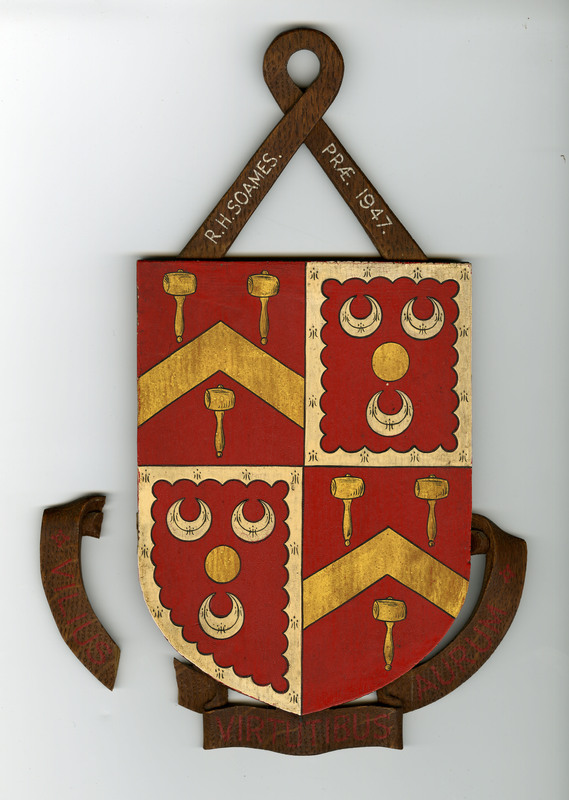 On leaving school in 1947, according to a custom dating back almost a century, he arranged for this copy of his family’s coat of arms to be hung in the Dining Hall, as was his privilege as a prefect. The origin of the Prefects’ Shields can be traced back almost to the foundation of Radley. In the 1850s William Sewell had attempted to commemorate members of the school with small brass plaques, none of which survive. But the senior boys opted for a much grander, more flamboyant personal commemoration, which they achieved with the help of the first art master, W. Florio Hutchisson. Hutchisson taught at Radley from 1855 until 1871 and during that period he was commissioned by individual prefects to paint their family coats of arms on banners of silk. These were hung initially in the Middle Dining Hall (now the Blue Room in Mansion) and the Gymnasium (now the demolished Old Gym) on three occasions each year, at Whitsun, Gaudy and All Saints Day – all festivals when the current school and Old Boys gathered. The original impact of the banners would have been almost baronial in style – the closest modern example probably to be seen in the Dining Hall at Hogwarts at the end of a Harry Potter film. 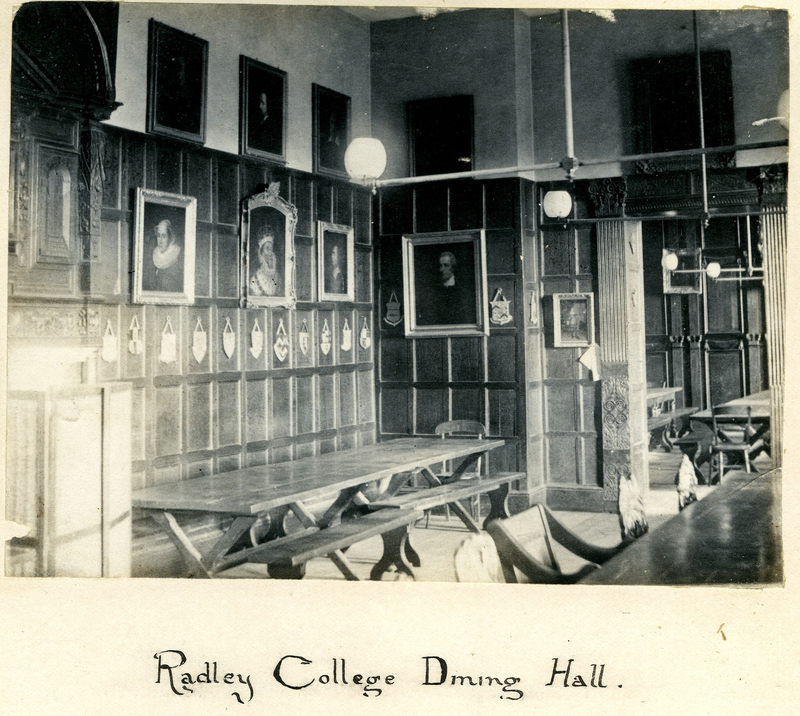 After the new Hall was built in 1910 the tradition of hanging the banners annually in the Hall at Radley festivals continued uninterrupted until the beginning of World War 2, when all festivities ceased and Gaudy was suspended ‘for the duration’. They were hung again for the Centenary celebrations in 1947. The most recent appearance of the Prefects’ Banners was in 2005 when they adorned the Hall for the Trafalgar Bicentenary Dinner. The prefectorial banners, as usual, assisted in the decoration of the hall and the gymnasium on All Saints Day. But why are they all of such ancient date? Have the present race of prefects never a sister or a cousin or an aunt to work them a banner… for a remembrance of their name in those halls in which they once bore rule? 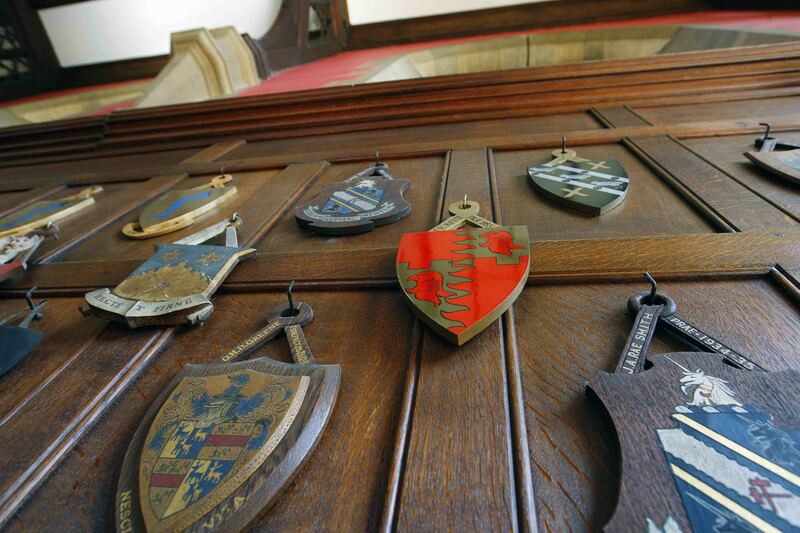 An alternative idea to the above is that each prefect should have his arms painted on a small wooden shield, each shield to be hung as a permanent decoration on one of the panels in the hall. There are one or two such, of unknown origin, already in the middle Hall, which would do for a model. So to answer the question ‘how long does it take for an institution to become an old tradition?’ in this case, less than twelve years which is equal to two generations of schoolboys. The ‘old tradition’ tottered on until 1935, with fewer shields being added each decade. In 1935, the custom reverted to presenting the shield on appointment, rather than on departure. This greatly increased the number of shields so that one third of the total now on display was presented in the period 1935 to 1947. These two dates mark two other events in the life of this tradition: the heraldic catalogue and the fervour of remembrance and commemoration instigated in 1947 when the Centenary of the school occurred so soon after the end of World War 2. The first of these was the initiative of a single boy at the school. During the eighty years of the presentation of the banners and shields, no one had ever compiled a heraldic catalogue of them. On 15th July 1935, Freddie Porter-Fausset of F Social, began the task, apparently unaided, within a fortnight of his last day at Radley. He was killed in action in the sinking of HMS Hood on 24th May 1941. In 1938 the newly formed Antiquarian Society reported that ‘much has been ready been done in the direction of classifying the shields in Hall’, and they heard a lecture on heraldry by Mr M Maclagen of Christ Church, Oxford. In 1942, just as Robert Soames began as a Shell, a small group of boys from the Antiquarian Society embarked on a catalogue using Porter-Faucett’s notes as a basis. As they worked, the shields were taken down and rearranged, some into family groups, such as the Raikes family on the east wall, and all were numbered by location starting from the west door. The cataloguing revealed that the heraldry was very complex. Technically there are numerous ‘errors’ in the coats of arms of individuals, the most frequent being that the individual named was not actually entitled to the particular form appearing on his shield. This is not at all surprising if the coats of arms were derived from family bookplates or seals. A talk on heraldry in 1944 was followed by a session in which ‘we soon discovered how vast is the territory to be covered, when we found ourselves still puzzled by the shields in Hall!’ One shield remains unidentified in 2012, another belongs to a family which has never had a son at Radley. Many of the shields were those of boys who were not recorded as having been prefects. This raises the question of physical evidence versus the written record: the records were amended when a new complete register of the school was published in 1947 – but without acknowledging that the custom concerning the privilege of hanging a shield might itself not always have been adhered to, for example, one teacher was so honoured – George Wharton, who lived and taught at Radley from 1863 until 1925. The catalogue was finally completed in 1948 by a teacher, Vyvyan Hope. Hope was then running the Old Radleian Society and thus the person in school with the greatest knowledge of all past members. The interest in the shields now shifted slightly. The knowledge that the shields were being listed increased the number being presented. Letters to Hope at the OR Society from this period frequently contain sketches of coats of arms, or notes from families, particularly fathers who were themselves ORs, to arrange that a prefect’s shield be put up in Hall to commemorate a man now on active service in the War. Families presented retrospective shields for past generations who had omitted to do it for themselves; in some cases men who had banners still in existence were also given a shield. So the purpose behind the shields changed, from being a statement about present honour, to being a commemoration of past achievement and continuity across generations. Hope’s catalogue carefully listed the location of each shield. However, in the sixty-three years since, Hall has been modified and decorated several times. Each time the shields were taken down, rearranged, and put back in entirely new locations despite the best intentions. The most recent survey was completed in 2012 to accompany this article. It is when they are removed from the wall that the shields become anonymous, seen purely as decorative items rather than a wall of living history. And it is a living history: fifty-two shields have been added since 1947, the latest in 2003. The custom has now changed – it is no longer any prefect who can put up a shield in Hall, only one boy in the entire school has the privilege: the Head Boy, the Senior Prefect. Once again, not every Senior Prefect has done so, and of those who have at least two shields are not recognised coats of arms, while one is certainly a spoof: three ducks – a rebus on the word ‘Dux’, the title of the Senior Prefect. So the shield itself has changed – it is no longer the armorial recognition of a family’s status being blazoned across the room, now it is just the shape of the object which makes it a part of the whole group, but its painted message is about the privilege of commemoration based on the individual’s own achievement. A fascinating tradition and one I have not come across before. Any chance of uploading photographs of the arms or the blazons?